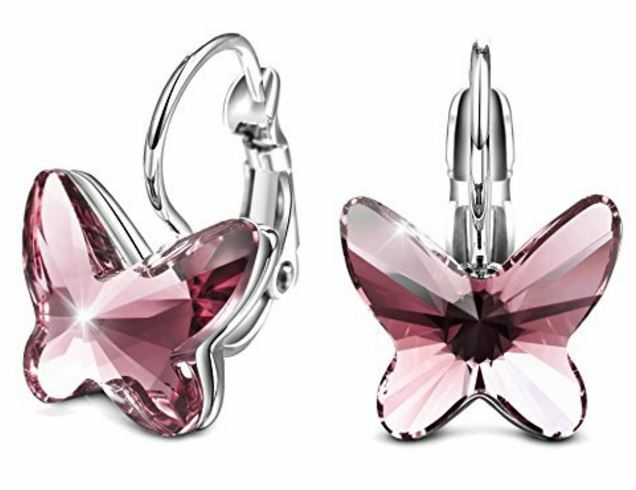 Swarovski Butterfly Earrings for Only $20! 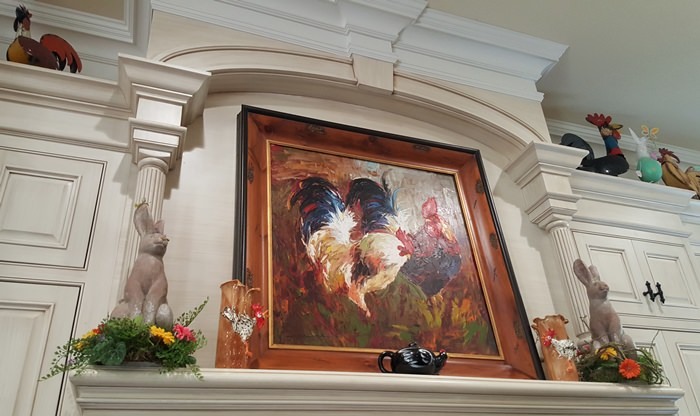 When I visited my friend, Marie’s beautiful home a few days before Easter, her home was decorated in the most wonderful, fanciful way for spring. Though I’ve posted a couple of times sharing her spring decor, I wasn’t able to share everything. 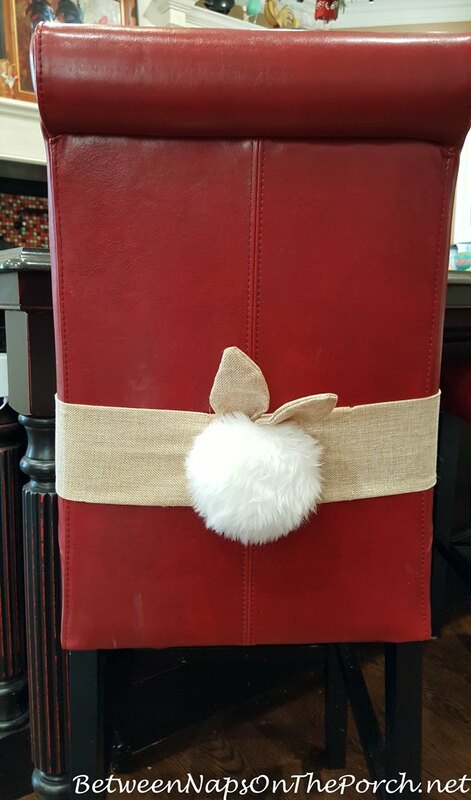 I could not let you miss out on her darling bunny tails and egg garland! At the end of this post, I’m sharing a few items that I ordered and arrived today. I love them all and thought you would enjoy seeing them, too. 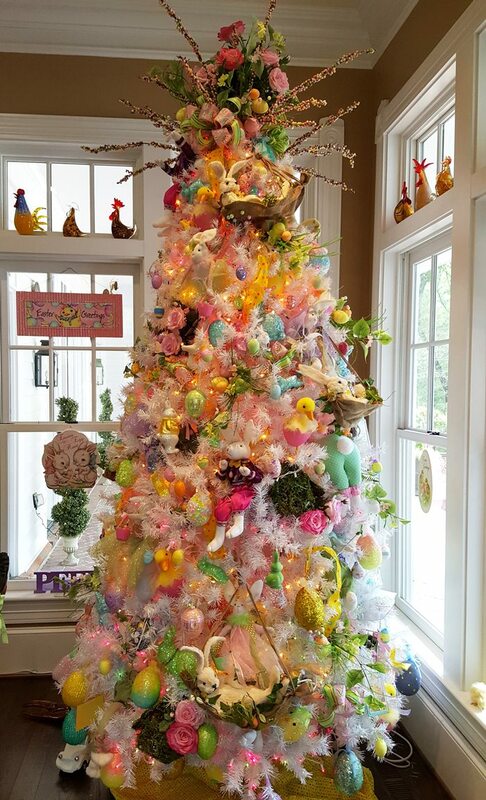 You may remember Marie’s darling spring/Easter tree in the breakfast area of her kitchen from this post: A Visit to Marie’s Beautiful Home for Easter. It stays up year-round and gets decorated for the various seasons and holidays. 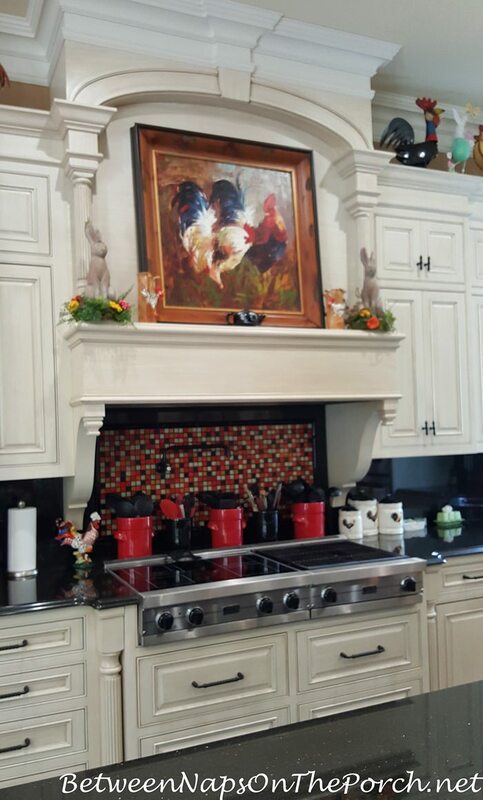 For spring, Marie added two adorable bunnies to the space above her cooktop/range area. Aren’t they absolutely perfect there! Here’s a photo showing this whole area. Sorry it’s blurry, but thought it was worth including in this post to give you an idea of how beautiful this area is in Marie’s kitchen. Marie wasn’t home that day for me to ask where she found these, but they are awesome! Actually, they wouldn’t be that hard to make, would they? They could be held together around a chair with a bit of velcro. 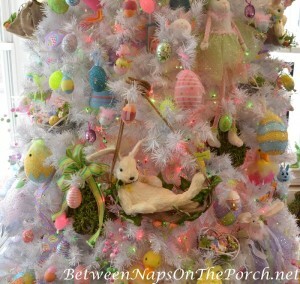 I may have to make some for next Easter for my porch dining table chairs. Marie always plans well in advance for each season/holiday. 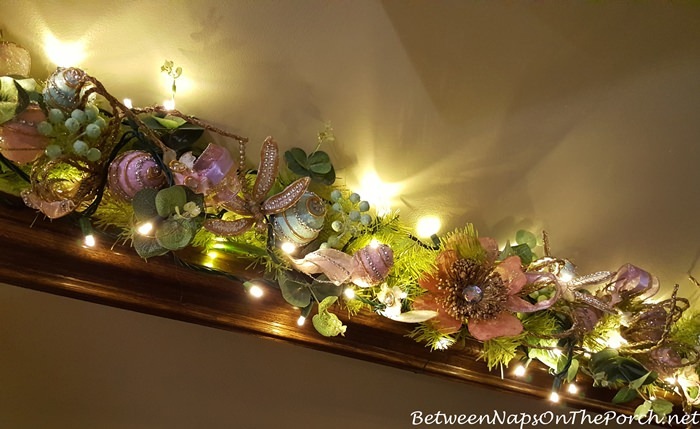 You may remember when I shared this preview of some garland she had ordered in early spring. Several folks ask to see where she used the garland. I meant to share that in a previous post so thanks for the reminder. 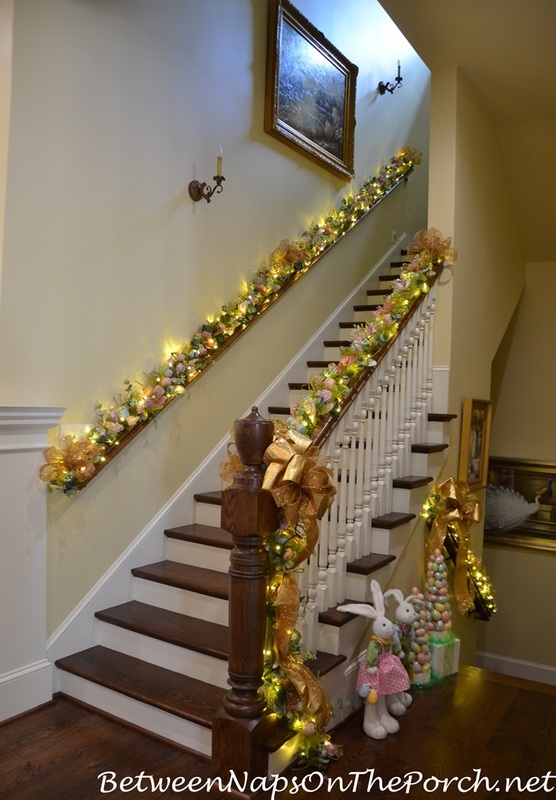 Here’s where that beautiful spring garland ended up, decorating Marie’s main staircase handrail. My camera really couldn’t capture how pretty it was! It’s gorgeous in person! 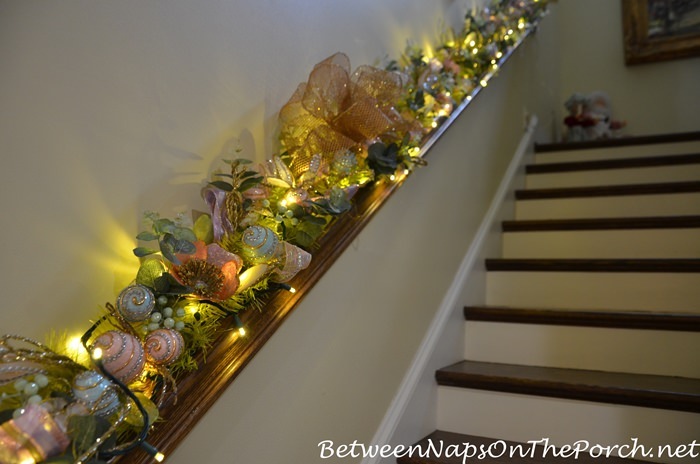 Love garland on your staircase? Who says it has to only be for Christmas! Marie found her egg garland at Pier 1. I love this little vignette Marie created for her butler’s pantry off the kitchen. Marie’s home is a magical, fairly land, no matter the time of year. I so love sharing it with you! You know how sometimes you order something and hope it won’t disappoint–then it arrives and it’s even better than you expected! That was my day, today. 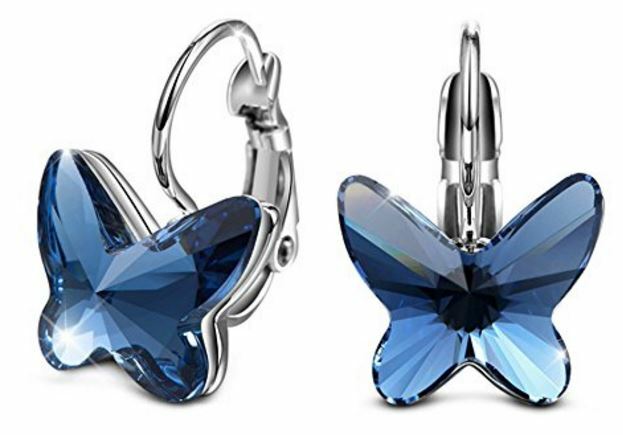 I’ve been in an earring mode lately and I came across these beautiful Swarovski crystal butterfly earrings online for just $20! I figured there was no way they would be as pretty in person as they were in the photos for that awesome price, but the reviews were so good I decided to take a chance. I noticed the information about them stated: “Environmentally friendly material copper alloy with white gold plating makes it exactly the charm earrings you want and no worry about sensitive ear.” My ears can sometimes react to earrings but since these were covered in white gold plating, I though I’d give them a chance. I’ve been wearing them all evening and so far they aren’t bothering my ears at all. Yay! They arrived in the cutest box, you would think I had ordered them from a luxury brand with this packaging! 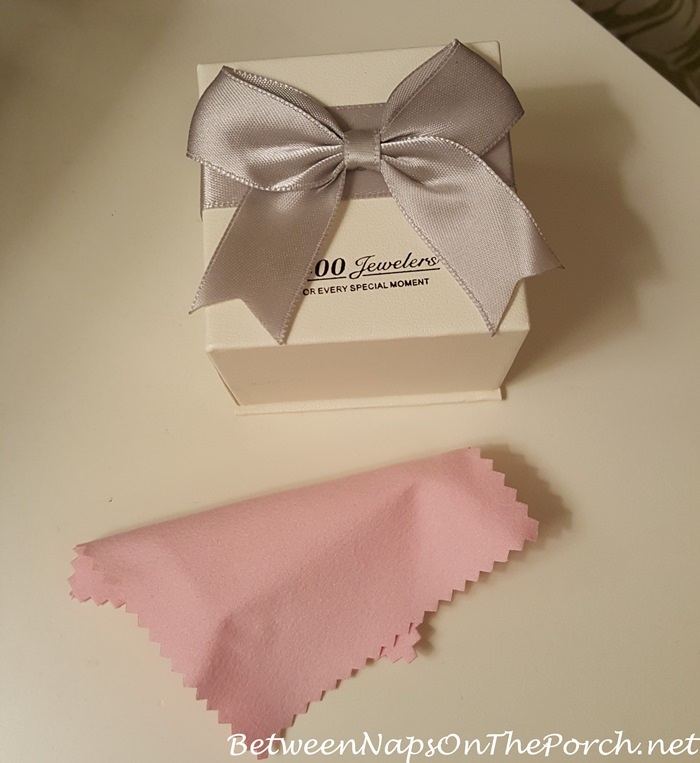 Tucked inside the box was a small pink cloth that’s perfect for polishing the butterflies if they get smudged with perfume or fingerprints. This photo doesn’t do these earrings justice! I’ll have to take a photo tomorrow in natural light. They are really beautiful and larger than I thought they would be. I was afraid they would be small, but they are the perfect size! At only $20, I ordered them in blue, as well. 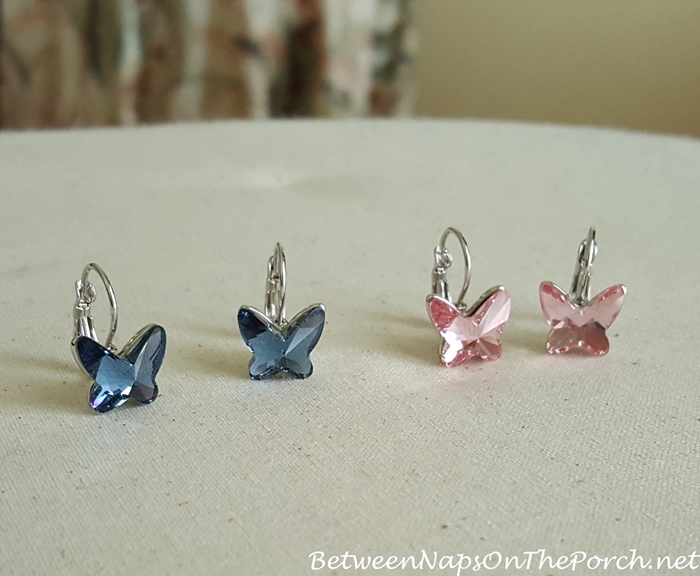 They are available here: Swarovski Butterfly Earrings. The other earrings I ordered and that also arrived today are these Swarovski Zirconia “diamond” stud earrings. Since real diamond studs aren’t in my budget at the moment, well at least not in a size that you can actually see with the naked eye, I decided to give these a try. I ordered the 2 cttw size (1 cttw per ear) and they are beautiful! They aren’t too big, in fact, I think I’m going to order them in the next size up, as well. Since they are platinum-plated, I’m hoping they will not create issues with my sensitive ears, either. At only $15, I’m willing to take a chance. 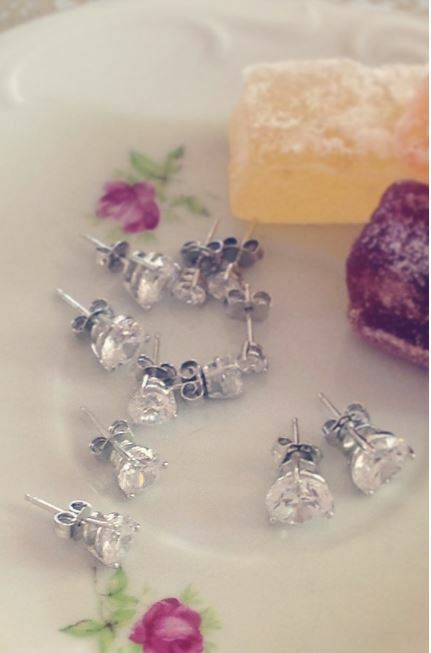 They are available here: Platinum-Plated Swarovski Zirconia Stud Earrings. The other thing that arrived was this body glide anti-blister stuff. A YouTuber I follow highly recommended it for when you’re wearing new shoes that could cause a blister. I had placed it on my wish list, but never got around to ordering it. Big mistake! Recently, I purchased new sandals for summer and though they are leather, they are really stiff. After they arrived, I wore them around the house with thin socks and thought I had broken them in. Ha! I wore them on a recent shopping trip and I now have a big blister on my left pinky toe. As soon as I got home that day, I ordered this anti-blister stuff and it came today. Once my blister heals and I can wear my sandals again, I’m going to give it a try. The reviews look pretty good so I’m hoping it will help me avoid getting another blister until the leather softens up some on my sandals. Anyone ever use this before and did it work? 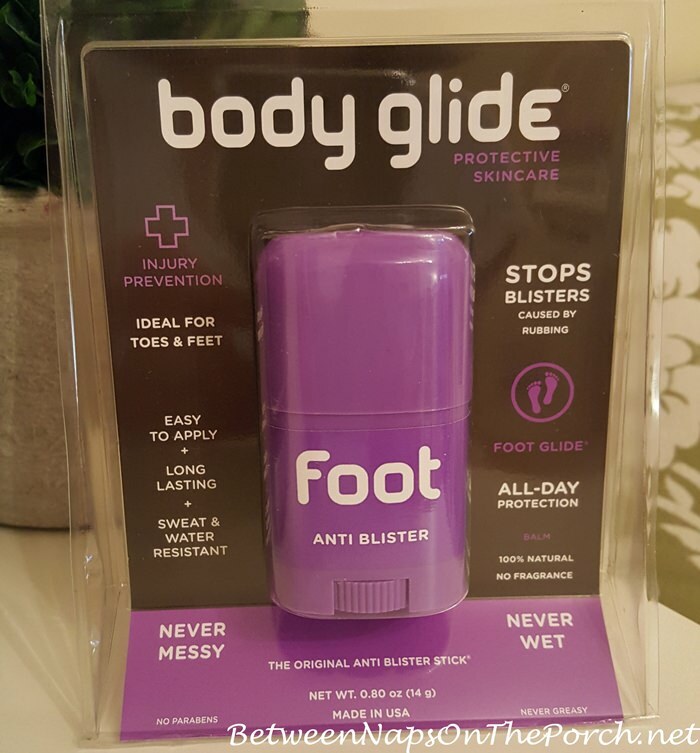 It’s available here: Anti-blister Body Glide. 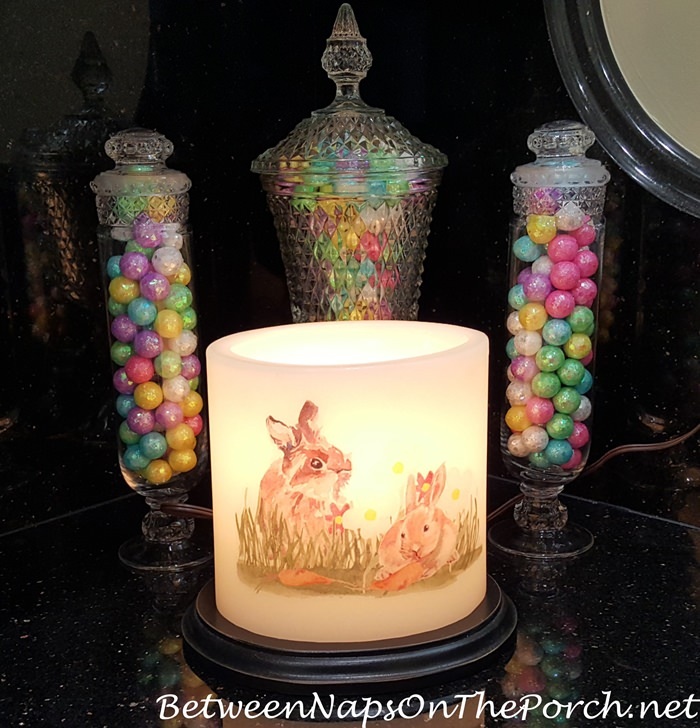 So glad I was able to share more of Marie’s beautiful home decorated for spring and Easter. Happy Spring, dear Friends! Next PostSurf’s Up! Beach Vacation in a Volkswagen Bug! I love the butterfly earrings. Beautiful. Also the studs. I’m wondering about the studs, are they heavy to wear. You know how some earrings make your ear hang down? 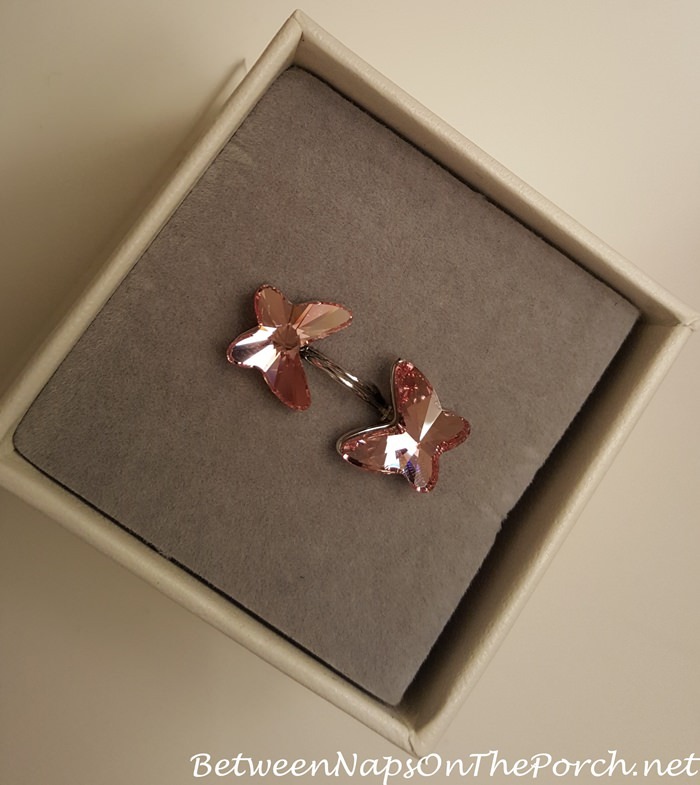 The little “diamond” studs aren’t heavy at all…and the butterfly earrings are not heavy. I don’t like heavy earrings, I’m always afraid they’ll pull down and widen the hole in my ear. These don’t appear to do that. Those bunnies on the backs of the bar stools are just too cute. Hope you make them for next year. Maybe a mini version would work for napkin rings? That would be sooo cute! This is just a beautiful website! I always can’t wait to see what next! Thank you for sharing!! 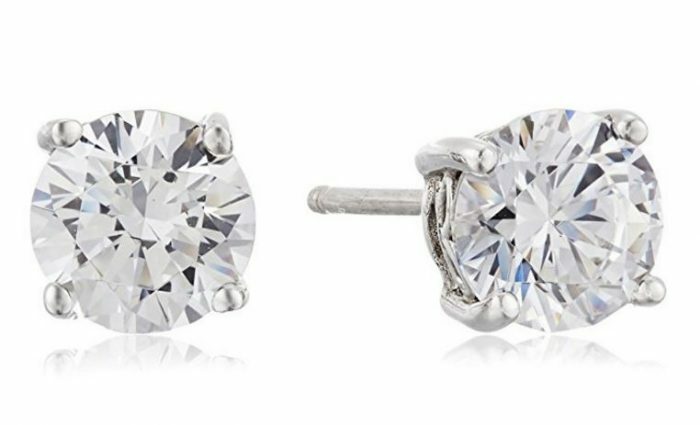 Love the earrings…but I must tell you, Nordstrom carries CZ studs that look SO MUCH like the real deal, I have fooled everyone I know. They are GORGEOUS. The metal is white gold (at least the top metal), so no allergy worries, and therefore a bit more expensive than other CZs I have seen. But SOOOO worth it. The brand is Nordstrom’s. They are currently about $50 for 3 carats (each earring! There are other sizes too.). They have a neat ‘cage’ backing that looks more expensive too. 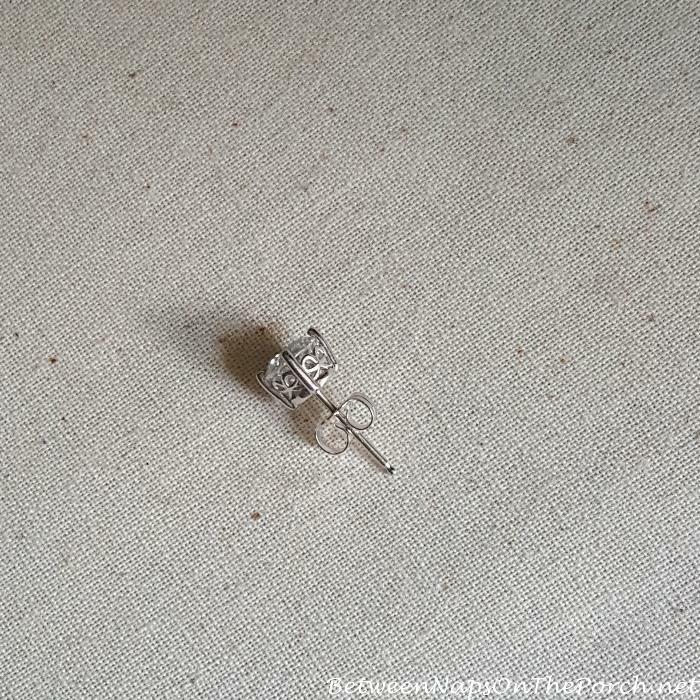 I lose earrings so often, I have learned not to pay too much for them…so this is a great alternative to us clumsy people…..not to mention us people on a budget! Rosie, that sounds so much like these earring. These also have the little “cage.” Each side of the cage has a “bow” design. I think I’d be afraid to wear actual diamond earrings unless the back screwed on or attached in some really secure way. See what I mean about the cute cage with the bow on the side. But the backs appear to be the same as the ones at Nordstrom. Send me a link to the ones you’re talking about at Nordstrom that have a different back, I haven’t been able to find them. I love these with the little bows on the side of the cage. Love seeing more of Marie’s beautiful home and her decorating. 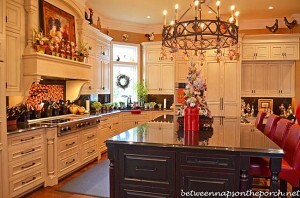 Her kitchen cabinets are gorgeous! The garland on the staircase railing was a dream. How does Marie attach it to the railing? Susan, your new butterfly earrings are lovely. I just ordered two pair from amazon. One for me and one for my daughter. Thanks for sharing all the great information. That’s a great question. I didn’t look very close, I’ll have to ask how she did it. You will love them, Anne! I just ordered a pair for my dil for her birthday that’s coming in a few weeks. Marie always has great taste in decorating for so many holidays. Thank you for sharing these photos with us. Wow! I am always amazed with Marie’s gorgeous home. 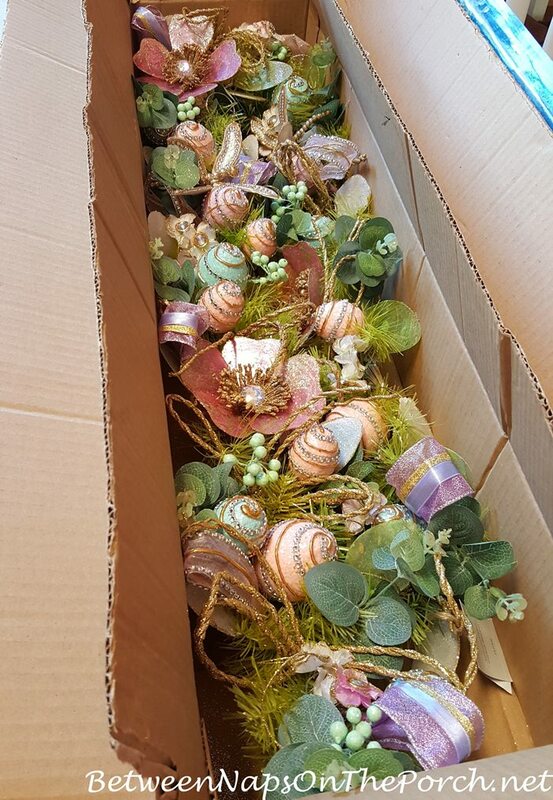 Where does she store all of the decorations for each season/holiday? It is obvious the house is quite large but does she have a separate garage, a basement, attic? Thanks for sharing and the butterfly earrings are beautiful. She has a full basement so lots of storage space there. She stores a few things in her attic, but mostly her decorations are stored in her basement. 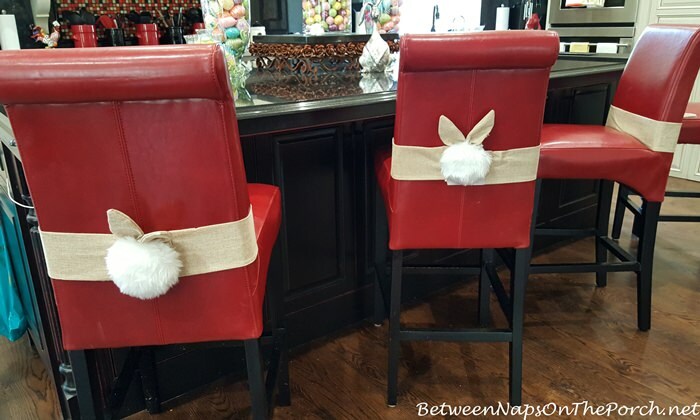 Just wanted to let you know that the bunny ears on the chairs were from Pier One. I also intended on making my own, but ran out of time 🙂 So hopefully you will make some next year and have your wonderful tutorial that I can use! Love the blue butterfly earrings, ordering some now. Hope you love the earrings! I also love butterflies and those earrings are too darn cute. I don’t have pierced ears anymore because they are sensitive, too. I’m tempted to give it a go, again, after seeing these. Thanks for sharing! Always love stopping by your blog. Yeah, mine almost grew back together, but thankfully they didn’t. I’m wearing the diamond CZ studs today and so far, they are not hurting. Maybe the key is to buy the ones that say they are platinum plated. I think the earring companies are catching on about our sensitive ears. Have used Body Glide for a few years now. It works really well. My ballet dancing Daughter and my football playing Son use it all the time to prevent blisters and chaffing all over their bodies . It’s a great product. not just for feet. Love your Blog. So good to know! I will definitely use it with all new shoes from now on. That’s a great idea for using it for other areas, too…especially during our hot, humid summers here. Thanks, Janice! I’ve used Body Glide for years! Blisters have never bothered me again since I started using it. I take a five mile walk every day and used to have trouble with blisters when I’d break in a new pair of sneakers. Now I use it every day…just in case. It’s a wonderful product and I highly recommend it; you won’t regret your purchase. Thanks, Jan! I’m so glad I ordered it, great to know it works so well! I will definitely use it the next time I wear those sandals. I ordered the studs before I even wrote this comment!!! I have used blister pads but not the product you showed. The pad worked very nicely. I always love seeing Marie’s house! 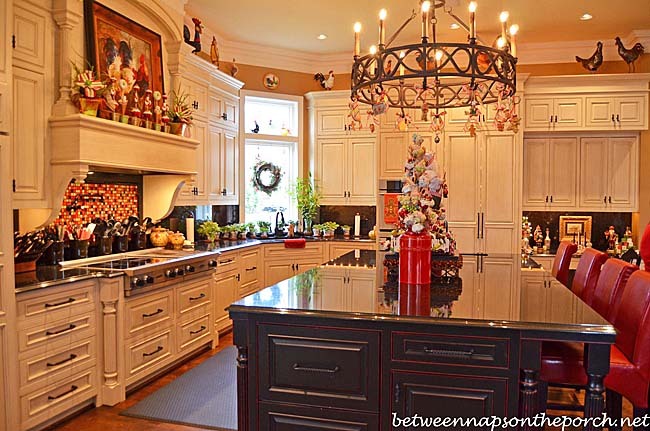 As always, I am mesmerized by Marie’s décor! She has a very special gift and I am so happy that she doe’s not mind you sharing it with us. The Easter garland is stunning. I would LOVE to spend a day in the room with the staircase trying to read a book and continually looking up at the mystical scenery with a huge smile on my face. Your earrings a beautiful. I am going to see if they have them in my daughter’s favorite color, purple, her birthday is next month. TFS. So glad you have good taste for clothes. Could not stand it until I call Talbots and ordered the two shirts you told us about. White with black polka dots and red plaid shirts just got them in the mail today and love them. Thanks again for having good taste. Aww, thanks Nona! So glad you got that polka dot shirt. It goes great with so many sweater/cardigans, etc… I love the plaid one, too. Mine came a few days ago and I’ve already worn it with some white pants. Thanks, Nona!